In the Evaluation Documents section, add a new vita or edit an existing vita. In the Document Type drop-down, click Add Vita. Select the Lock Vitas check box. Select the appropriate lock method. A Copyright and Disclaimer Notice has been added to the Journal Lists screen and New Upload (Journals and Journal Metrics) screens. This pop-up window now displays each time a journal list and journal metrics are imported from an external source. When a faculty member is performing an evaluation, the academic terms for each evaluation document now display on the View Faculty screen. In the Perform Evaluations section, click Evaluate for the desired evaluation process. The View Faculty screen displays. The Grants section now displays the Total Funding for each grant. In the Activities section, click Grants. 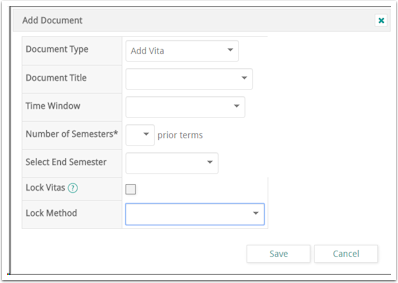 Grants are now displayed by the grant status on vitas. When the start date for an evaluation step within an evaluation workflow is set to “Completion of Previous Step” and Early Access Notification is enabled, a message now displays in the To Do section on the Dashboard for the evaluator, alerting them that they have early access to an evaluation. Previously, only an e-mail message was sent to the evaluator alerting them of the early access to an evaluation.